First Cycle institution, Rockies International School has crowned its academic year with a maiden sports festival at its Tantra Hills campus. Themed ‘Health is wealth for education and prosperity’, the program sought primarily to promote regular exercise in the school. The smartly dressed pupils engaged in disciplines such as lime and spoon race, volleyball, basketball, choreography as well as cultural performances. Director of Academic Affairs, Rockies, Rayhann Shaban, said “We are happy to partner GTV Sport + on this auspicious occasion. GTV Sport is rolling out a programme dubbed ‘P.E. Time’ in basic schools to support government’s plans of revitalizing sports in schools to help feed national teams in the various sporting disciplines. “Given that, the vision of the C.E.O of Rockies International School, Okyeame Ampadu Agyei, ties in with this agenda. Rockies believes, as the theme clearly spells out, that sports helps the child gain two main things: health and wealth. “A healthy child would be regular and active in school and that surely would help improve his /her academic work. The child is saved from some decent lifestyle diseases like obesity and its attendant problems. He said the school shares the vision of National Sports Authority, (NSA). Professor Twumasi, the Director General of National Sports Authority, entreated Ghana Education Service (GES) to reintroduce P. E in schools; both public and private. The school has a world class gym, possibly the first of its kind in a basic school in Ghana where pupils take turns to attend when their time is due. 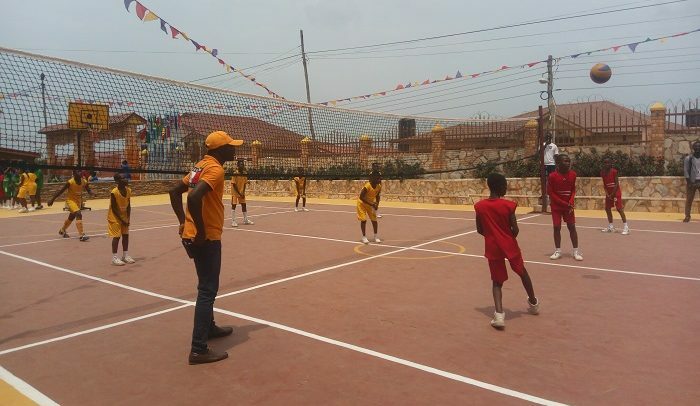 It also has a multipurpose court for basketball, volleyball, tennis, netball, badminton etc. Rockies has a football pitch which doubles as its athletics arena.